This is my first post in the forum. But I have been reading threads here for quite a while now. Would love to get some advise on the 'problem' I am seeing in my new tank. Substrate-> Amazonia, with a layer of the powdered variety on top of the 'carpet' area. Fertilizer dosing-> about 1 - 2 pumps every day. > It's been only about 2 days since I have planted the tank, so I might be getting too hasty. But wanted to get the community opinion anyways. Monte carlo & Marsilea aren't looking that great. Lots of yellowing, dying plants in the bunch. Zoomed in showing the MC, it shows the yellowing to a certain extent. But I will attach better pics if necessary. I had tried to plant all the foreground ones by separating the full bunches as much as possible, to the point where I was almost handling individual plantlets. Additionally, the Marsilea came in its emersed form, which was rather tall. So, for the most part, I had cut them up and planted both the top half(the four leaf with the stalk) as well as the bottom half(the runner/root section) separately. Was this a mistake? Also, I had ended up ordering too much plants, so I tried to fit them all. Could this potentially be a problem? Is 'overplanting' a thing? > Newly set up high tech tank shows a lot of yellowing/dying in Monte Carlo and Marsilea Hirsuta. > Looking for opinions/suggestion on the same. Is this just the plants trying to adjust from emersed to submerged form? Or does it indicate any deficiency? Would really appreciate any advice y'all can provide. With a newly started Amazonia tank your not really going to see any deficiencies especially after a few days. The only think you really need is K and micros since everything else is in the substrate for a while. Are you following water change guidelines? Which should be 50% daily for first week. Otherwise ammonia levels might be too high even for plants. Well, I had started the tank about 2 weeks before planting. And, during that period, I had kept the filter running and also done a few water changes. Hence, I am going for a wc per 3-4 days. Do I need to up that frequency? Take this with a grain of salt as im not as experienced with high tech aquariums. However; Your water looks a little green to me (or maybe it is just the image). If it is... I find that usually something is a miss and my higher light ground plants start to melt (monte carlo especially). I checked everything and found my nitrates were very high and on top of that I was dosing Thrive C and excel. 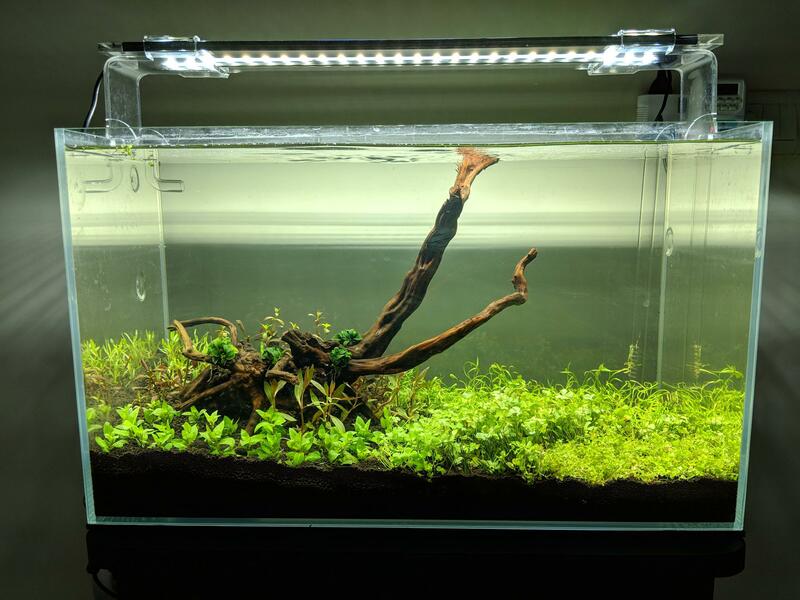 So I started doing daily large water changes and only dosed micros (flourish) at 1/4 strength and reduced the light (although your light isnt that high right now). The plants started to come back... I feel like Monte Carlo will always tell you if its not happy. You should always follow the guidelines to be safe. every day 1st week, every other day 2nd week. This should've been done from the beginning. There is no reason to wait to plant. Anyway yes I would up the water changes and see if things improve. With an Amazonia based tank in the beginning the only issues are going to be lighting and co2. I don't know the light you have but 2-days out I don't think it would affect the plants that quickly. Thanks, both of you. Point taken, I will up the water change frequency... did one today itself in fact.